Vacation rental house. Sleeps 9, 4 bedrooms, 2 bathrooms. No pets allowed. 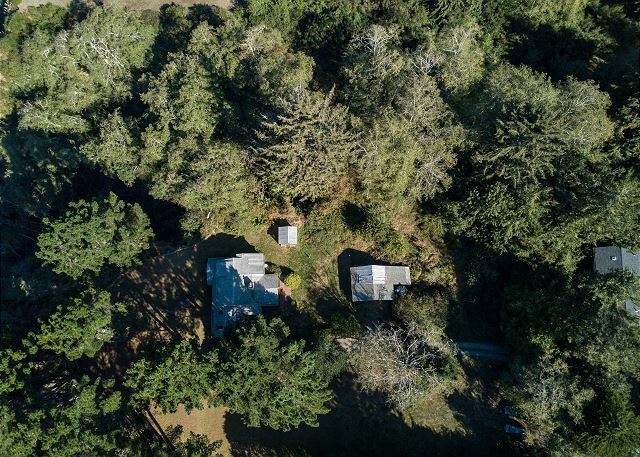 Shaded under old Coastal Pine trees, set back on a bluff and open meadow is a lovely 4 bedroom/2 bathroom home that sleeps up to nine guests and is great for a family vacation or a getaway with friends. 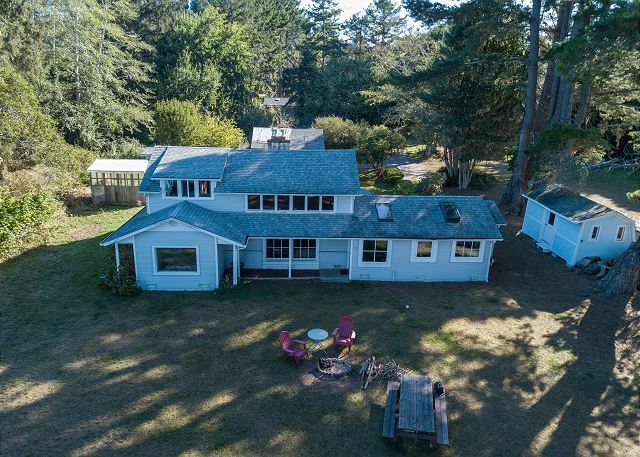 Located just outside of town off Westhaven Drive, above Scenic Houda Point (aka Camel Rock) this home offers privacy, scenic coastal views, and just a short distance to the beaches. There is even a nearby man-made trail down to Scenic Drive, where you can access multiple beaches by foot (may be challenging for the nonathletic). The home offers comfort and large open windows; perfect for relaxing and enjoying nature, and for the opportunity to escape the stresses of busy life. 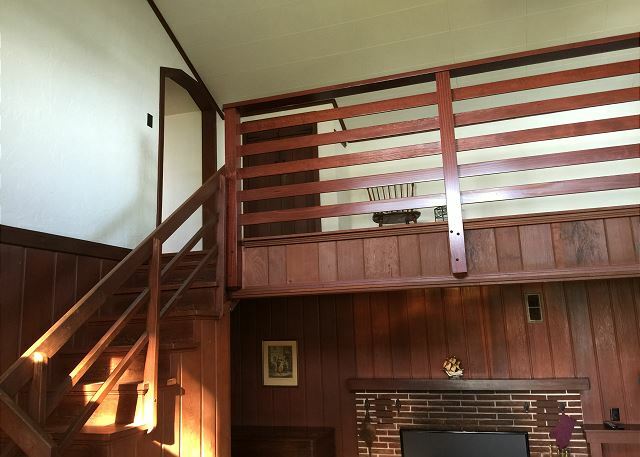 Sit on the upper balcony above the living room for another view of the outdoors. 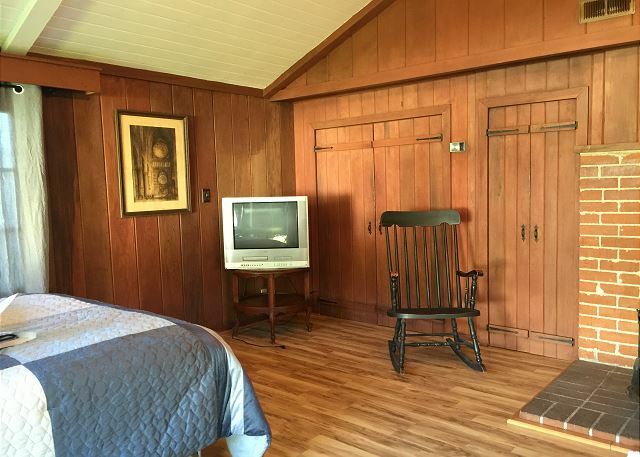 For those who prefer the inside, there is Flatscreen T.V. with basic cable. 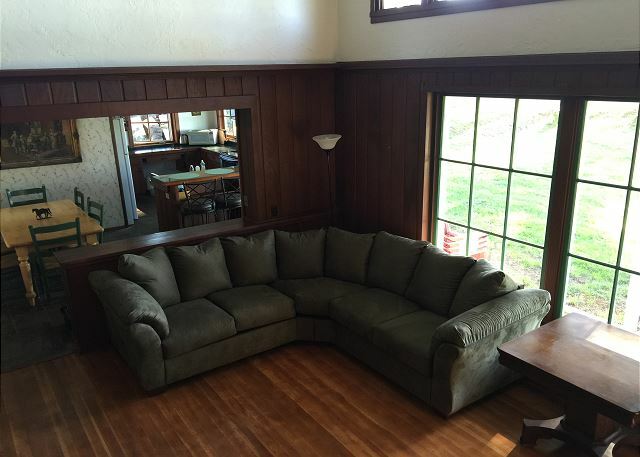 Or relax on the sectional sofa in the lower living room and take in the ambiance and warmth of the wood stove (please bring own wood). 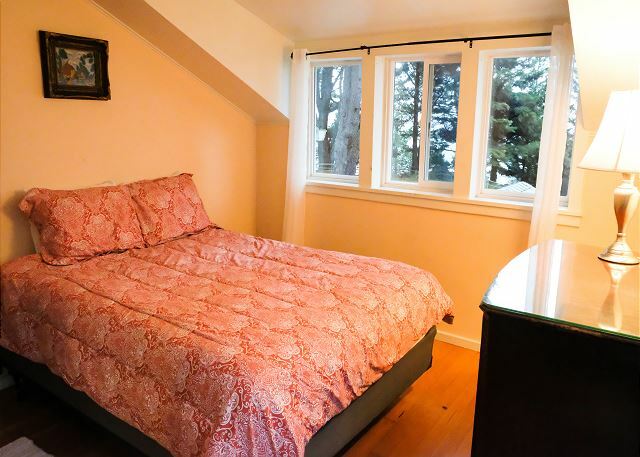 Downstairs master bedroom has Queen and Full bed, and its very own wood stove. Surrounded by windows and a sliding glass door, be ready to greet the morning sunlight. 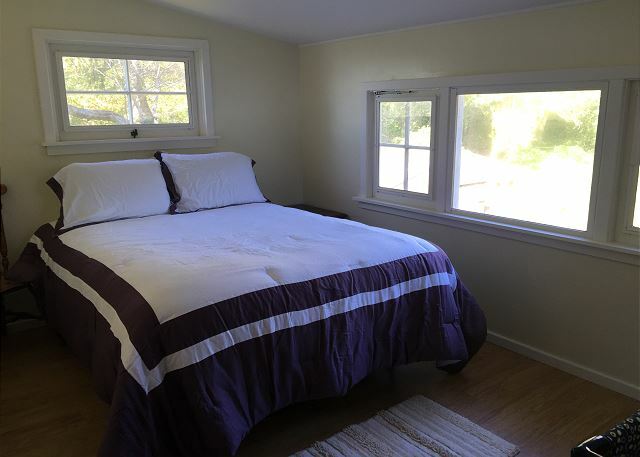 There is also a small Queen room off the living room with open windows that face the back yard. There are two Queen rooms upstairs, one with a portable crib if needed. The kitchen is well-appointed with all the basic amenities. The shared dining room space seats six, and the breakfast bar in the kitchen seats four, with two additional chairs if needed. The access into and out of the home and bedrooms makes this home easy for everyone to spend time quality time together. There is a washer/dryer for your convenience, located off the kitchen. 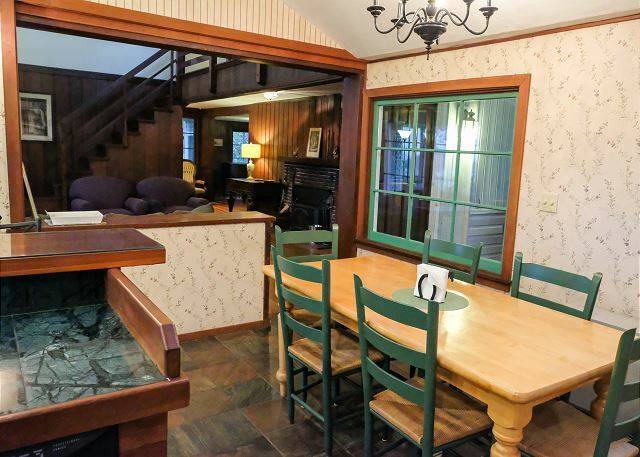 This home has every convenience and allows for a truly relaxing vacation. This home may not be rented with the intent or purpose of hosting an event or party, and drivebys are performed through various hours of the evening, after quiet hours begins, for security and to ensure there are no neighborhood disturbances. Maximum is occupancy is 9, maximum cars permitted are 2 due to limited parking and shared driveway. A 3rd may be approved in advance by management staff only. No RV's please, driveway is narrow and will get stuck on the trees. • Please note - The entry portion of the driveway is shared with people who rent part of the field for their horses. This field is not part of the rental and is away from the house (not a featured part of the rental property). 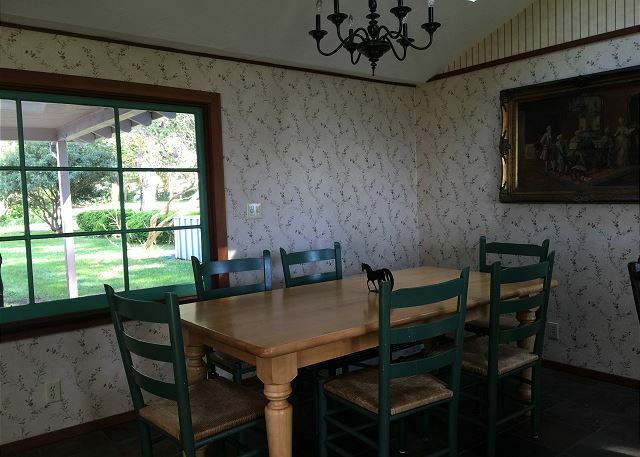 The owner/caretaker of the horses will not come to the vacation rental house or disturb guests during their stay. 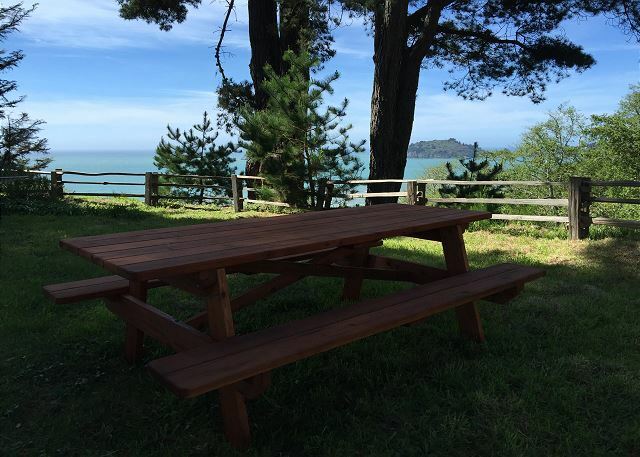 Thank you for your recent stay at the Seaside Meadow and for booking with Redwood Coast Vacation Rentals. happy to hear you and your family loved the home. Please visit us again any time! There were 9 of us coming together to participate in the Clam Beach Run. The location was perfect. The home provided adequate beds and a great kitchen. Views were great. Had a great time. So happy to hear that the home was a good fit for your group participating in the Clam Beach Run. The Seaside Meadow actually sits above a portion of the race which makes it that much more special for those attending that the event. We hope you all will return to us again for future stays or for that event run again. The home was clean and comfortable. The view was even better than I thought it would be. The location was very convenient, close to beaches and restaurants and Patrick's Point State Park. We will definitely rent this property again! Thanks for the great review of the Seaside Meadow and we definitely hope you do visit us again! Gorgeous well-loved house, homely and welcoming, but the best thing is the garden with its fire pit and the view from the bluff. Just wow! Loved this place. And a great location for exploring the redwoods. Spectacular home and amazing views! The Seaside Meadow is an amazing home. It is large and simple, and many have described the home as a large cabin-like house. 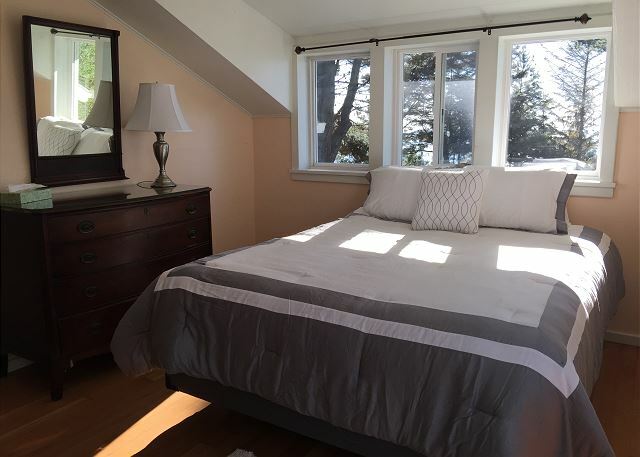 It is in a great location just a short distance from the highway and State and National Parks, beaches and towns, and is also comfortable enough to just hang out at home or in the yard with the family. I am so glad you loved this unique home, and do hope you will visit us again soon. Suberb. The home was very nice the view was fantastic. The home was neat and clean and the view was fantastic. The location was quiet and peaceful and the town cozy with a good restaurant. Oh! Did i mention the view was fantastic. Thank you for the opportunity to truly cap off the end of our vacation. The Seaside Meadow is a special place. The home is unique and in a very peaceful neighborhood, and you are right...The View! Thank you for your recent stay and for making us a part of your vacation and memories. Please consider us again if you ever return to Trinidad. Merci pour votre récent séjour à la maison Seaside Meadow. Je suis ravi que vous ayez trouvé la maison agréable et j'espère que vous reviendrez bientôt nous rendre visite. We arrived at this lovely home to find soft music playing in the living room. 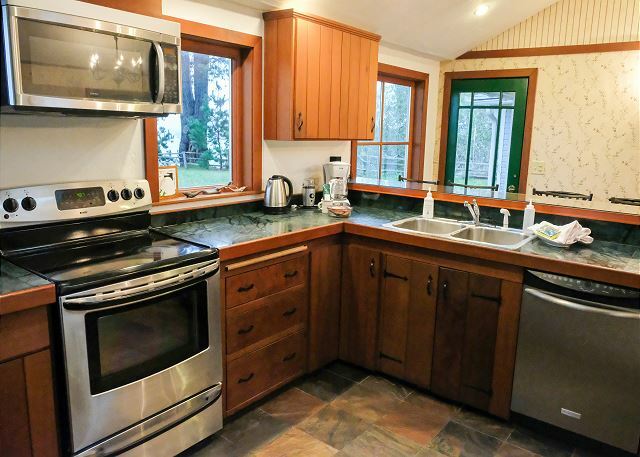 This home is very comfortable with a complete kitchen. 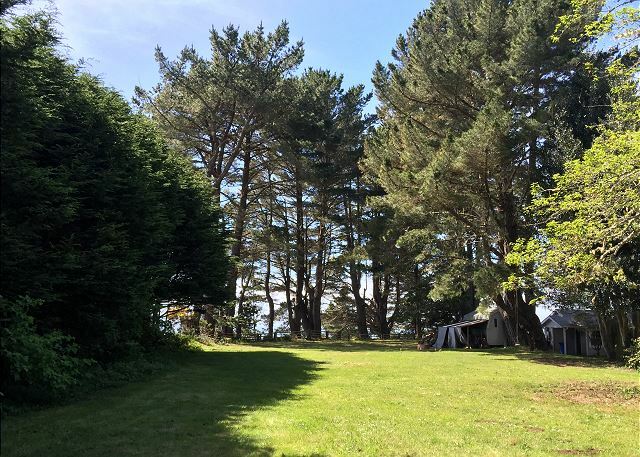 The back lawn overlooks the Pacific Ocean and even has horseshoe to setup and play. We spent a lot of time outside enjoying the beautiful view. The house was warm at night with comfortable beds. You could easily sleep 8 and a couple of kids. Thank you for the kind review of the Seaside Meadow. I am glad the home was comfortable and you enjoyed the yard and view. 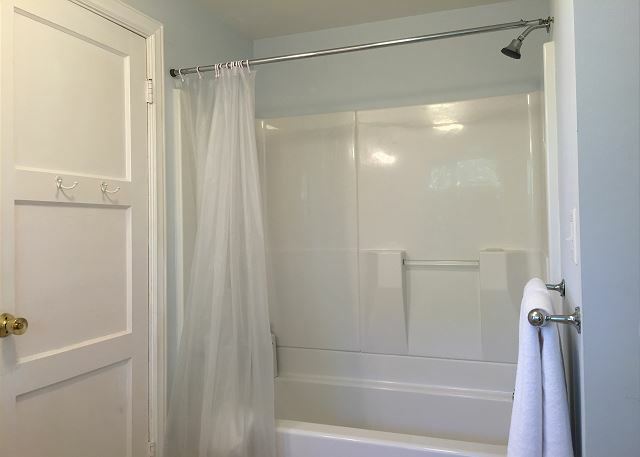 This home is definitely perfect for a large, quiet family visiting our area. Please look us up again if you return to visit the redwoods. We had a wonderful time in this house! The place is superb. The view of the ocean is so beautiful! The house is very comfortable. Would come back again! I really recommend this place. Thanks! Awesome house and view! Thank you for choosing the Seaside meadow and for booking with Redwood Coast Vacation Rentals. Old world accommodation with all modern conveniences. Comfortable and spacious, very private. Beautiful Home and Property to relax at. We loved the views and the space in the house. The yard was awesome and next time we want to bring our grandchildren. Thank you for your recent stay at the Seaside Meadow. We hope we can accommodate you again in the future. Loved the location of the house. It was wonderful. The Seaside Meadow is a great home, and WOW, what view! Glad yu had a wonderful stay and we hope you will return for many future vacations to come. The house was clean and comfortable. The view was breathtaking. We were able to relax and enjoy the company of family without stress. The management company was wonderful to work with and very responsive to our needs. I am glad this home was a good fit for you and your family. The Seaside Meadow is perfect for a large family and provides enough space for relaxation. The view from the bluff is absolutely amazing, and breathtaking. Always good know the staff was responsive and good to work with...thank you for sharing that information. We hope you will return to visit us again. This was a very charming old renovated farmhouse, very comfortable. It felt very private like you were separated from the neighbors. The view was breathtaking. Really enjoyed staying in this area, so much beautiful scenery. Would definitely rent this place again. 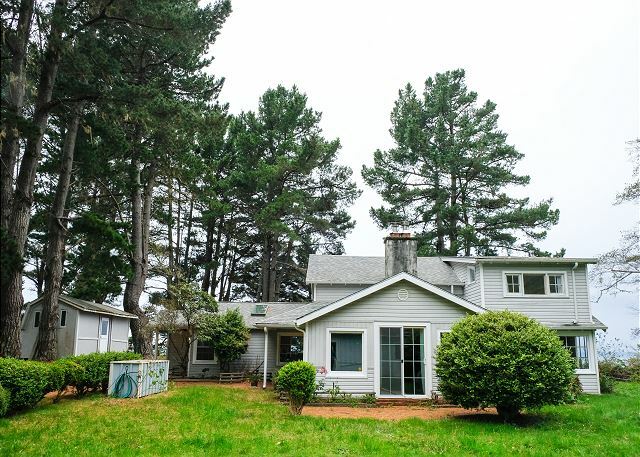 The Seaside Meadow home is a converted old farmhouse, set above Scenic Drive, which was once the old highway. The breathtaking view is of a couple of our most popular beaches, and on a clear day spans out to expose beautiful Trinidad, all the way down the coat. The layout of the rooms offer privacy from each other, and the yard is great for the whole family to enjoy. 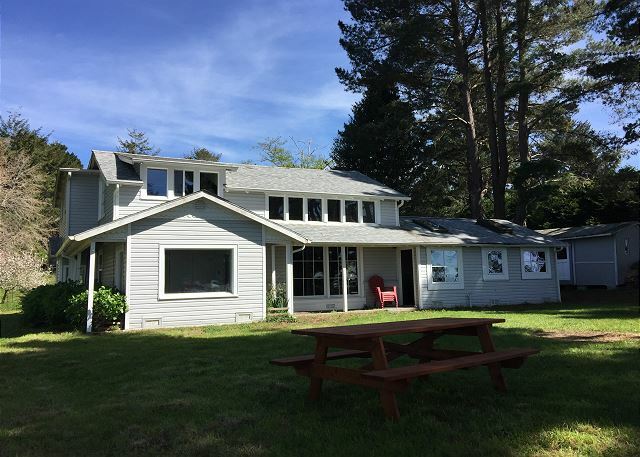 Thank you for choosing this home and for booking with Redwood Coast Vacation Rentals. We are so glad you enjoyed your stay. Beautiful location that feels like home away from home. 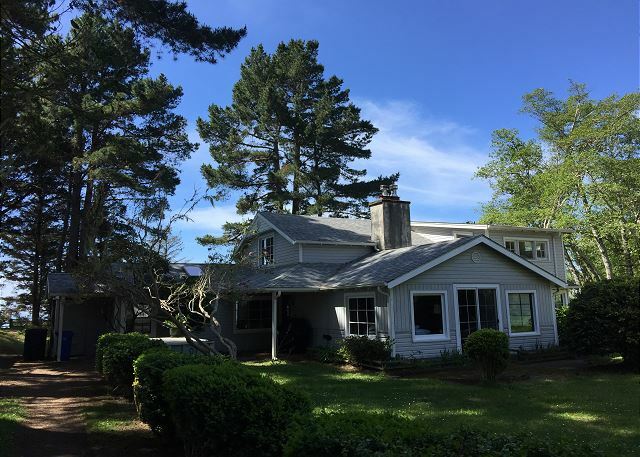 Beautiful grounds and home with plenty of space and privacy for a large group or several couples. Amazing views from the lower and upper rooms. The back yard is big and open with shade, sun and incredible sunsets. House was reasonably clean and had everything you might need for a couple days or longer stay. This is an interesting home in a unique location. The Seaside Meadow is set nicely on the bluff, situated so that the back yard offers itself usefully, while still having a view. It is an older home, and does allow for a very large family. I am glad it served well as your home away from home while visiting our scenic and lovely area. Beautiful views and wonderful house! Thank you for choosing the Seaside Meadow and for booking with Redwood Coast Vacation Rentals. We hope we will have the opportunity to accommodate you again in the near future. We loved the house, location and view of the ocean below. It was everything we wanted and we hope to return in the future. We found the house to be perfect for the four of us - plenty of space to spread out. It was a great location from which to explore the Redwoods and the beaches. Just wish there had been a trail from the property to the road below but we didn't mind the hike around down to the beach. Thank you for the review of the Seaside Meadow. This is a great family home, in a great location for exploring our area. The bluffs below the home are not suitable for building a trail, but in the future, there is one just a short walk from the home, had you gone back out the driveway and walked around the gravel dead end. The trail is kept up by neighbors and leads down to Scenic Drive where the beaches are just a couple minute walk. I am glad you enjoyed the home and hope you will return for another stay. It's a clean , sielnt and beautiful place to stay with your family and loved ones and the view form the house is austonishing.. 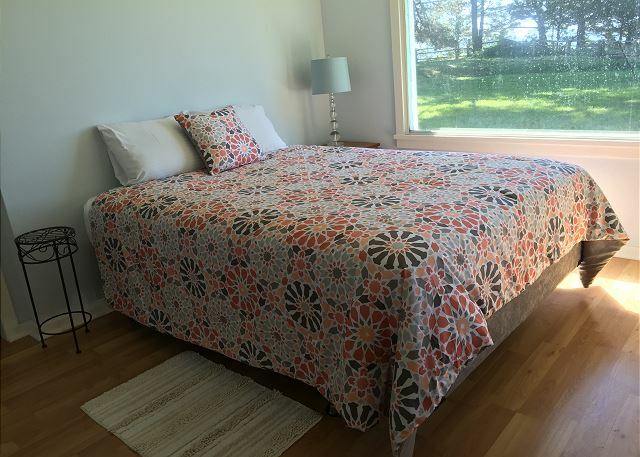 Thank you for choosing the Seaside Meadow home and for booking with Redwood Coast Vacation Rentals. We are glad to hear you enjoyed your stay and hope you will make it back to visit us again. Family fun. So glad we found this house! Seaside Meadow is a great family home. Situated on the bluff in such a way that the yard can be enjoyed and still have a wonderful view of the ocean. Perfect for the large family, for any occasion. The view from the property is even more spectacular than pictured. The location is quiet and private, yet convenient to town and shopping with many beautiful beach and forest areas to explore nearby. The number of bedrooms, furnishings, and the size of the kitchen and living room make it ideally suited for a family gathering. The property does not have central heating, so there were a few chilly spots throughout, but the two wall units on the main floor and the availability of portable heaters sufficed. The property manager and staff at Redwood Coast were very helpful in accommodating us when our plans changed and we requested to arrive a day early. We would definitely book this location again. I am so pleased to hear that this home was a good fit for you and your family and that we were able to accommodate the earlier arrival. The home is so perfect for a large family and with that yard and view, what a great place to stay and enjoy time here on our coast. 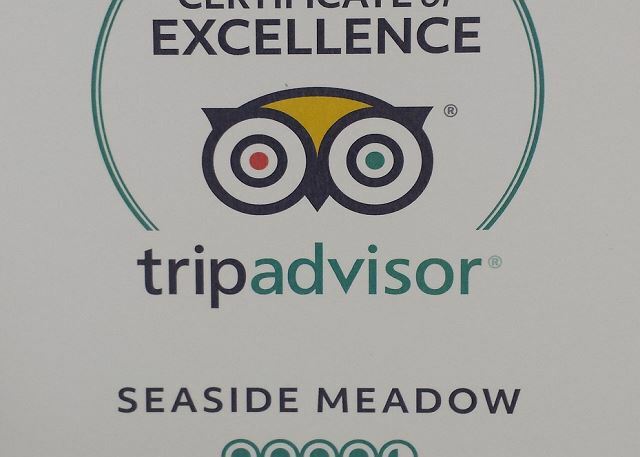 Thank you for choosing the Seaside Meadow on the Bluff and we look forward to having you back again. We had a wonderful time and hope we can come back soon. 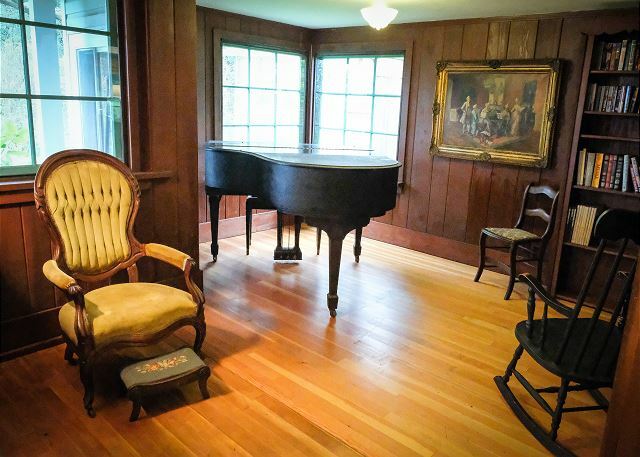 The only issues that need to be addressed in the fireplace in the living room is not functional, we found one bar stool that was broken previously and not safe to use and the two antique chairs in the piano room were not usable. Other than that is was a fantastic 4 days. Thank you for the review of the review of the Seaside Meadow. We have recently installed a second heater to the home due to trouble with the fireplace, as also indicated via our phone conversation. Due to high occupancy rate of the home, we had not been able to coordinate with the fireplace repairman until early November, and as such, we hope to have it repaired soon. We had no knowledge of any broken chairs, so thank you so much for the information. We are glad you had a nice stay and we do hope you will return to visit us again soon. Beautiful location and scenery, older home needs upgrade. of note the staircase is noisy. The interior needs more lighting specifically the downstairs back bedroom with the sliding door. Very comfortable house!! Seaside Meadow is a very unique home. It has a very rustic, cabin-style feel to it, yet has a large back yard overlooking one of Trinidad's most popular and scenic beaches. The home does have a dark feel, and all the dark wood contributes to that effect. 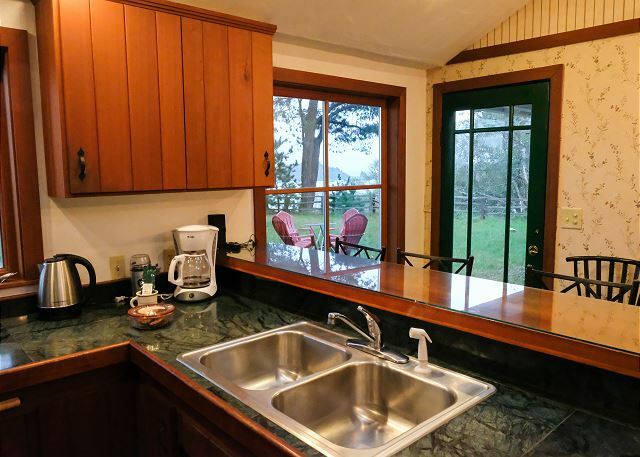 Thank you for choosing this home and for booking with Redwood Coast Vacation Rentals. We look forward to serving you in the future again. Loved the house, view and location. Called for location of a pack and play crib but never received a call back or email. Also floors were dirty (our socks and bare feet had dirt on them) from the first day. Otherwise loved the experience! So glad to hear that you enjoyed the Seaside Meadow and I am sorry to hear that your call was somehow missed. 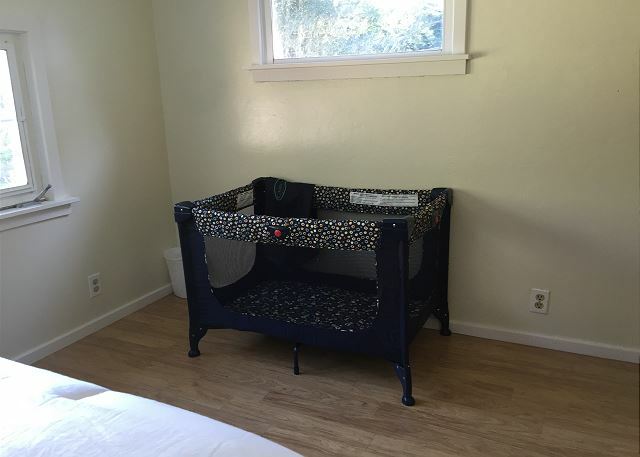 For any future stays, there is a permanent pack-n-play in the home that never gets removed and it was still in the closet upon your departure. We do hope you will return to give us another chance, otherwise, thank you for staying with us. We used this property to house family members who didn't all fit at another nearby property we rented for the same week from the same agent. As soon as I walked in, I knew that while older, and well used, this property had real charm. When we went out the back to see the view, I was very happy. The property is described pretty accurately. The double queen room is pretty unusual. 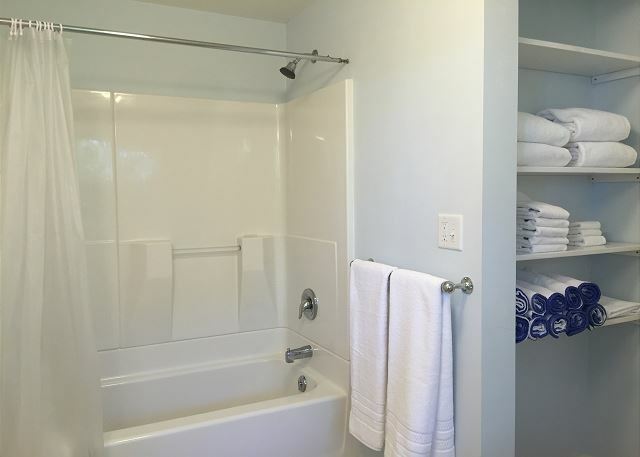 It shares a bathroom with the downstairs bedroom. This is a very well maintained house. It's clean, everything works, and it is pretty well equipped. The rental agents are very helpful and friendly. Although you can get to Trinidad via Scenic Drive, and you should do so once, take 101 up the exit to the town. Murphy's Market in Trinidad is a very nice grocery store, good selection, reasonable prices considering, and very nice staff. Really no reason to haul a lot of fresh food in. We also visited the Costco in Eureka which is about 30 minutes from the property. The location is secluded. You have a real sense of privacy. There is a lot to see and do in the area. I recommend stopping in at the Thomas Kuchel Visitor Center in Orrick to talk to the rangers there. They are really, really nice and give you lots of great info on what to do. What a great review of the Seaside Meadow. I am not sure there is much I can add. Thank you for choosing this home and I hope you will return to visit us again. The house was comfortable and tidy enough. The backyard and views were even better than we expected. Direct views over beaches and lookouts, a fire pit with plenty of wood to keep you warm outdoors while enjoying the views. Loved it. We had an excellent time at Seaside Meadow. The location was beautiful, and the house was fantastic! I hope to come back again. The Seaside Meadow is a unique home. From the outside it looks like a normal house, from the inside, you definitely feel like you are in a large cabin somewhere. It is such a unique property. I am glad to hear you thought the house was fantastic. 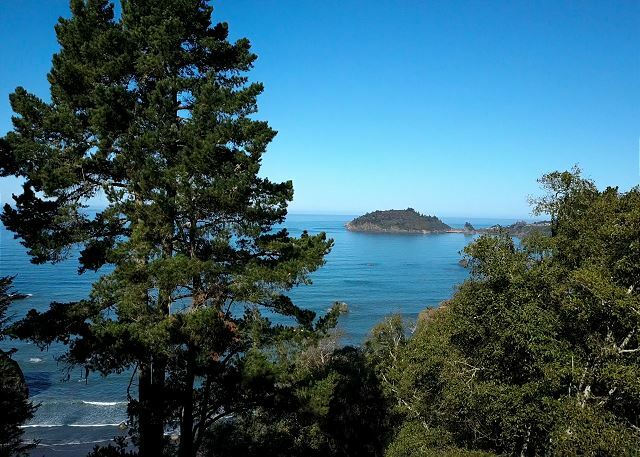 Thank you for choosing this home and for booking with Redwood Coast Vacation Rentals. We hope you will return to stay with us again soon! The house was perfect for our 3 generations of family's visit for a wedding. 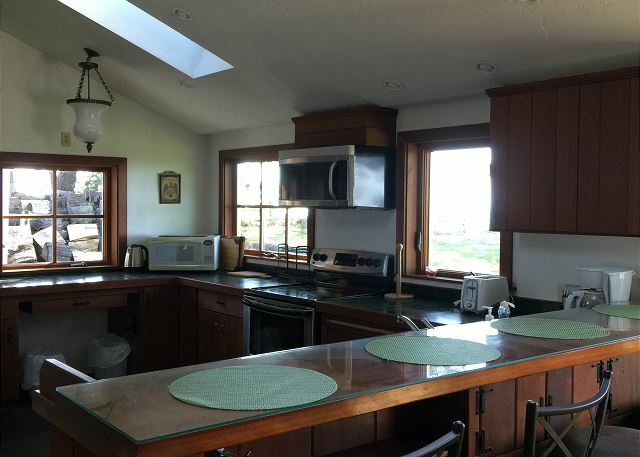 Very comfortable living spaces, well equipped kitchen and amazing vistas of the Pacific. Thank you for booking the Seaside Meadow Home. What a great house to stay in with generations of family, and what a view to enjoy! 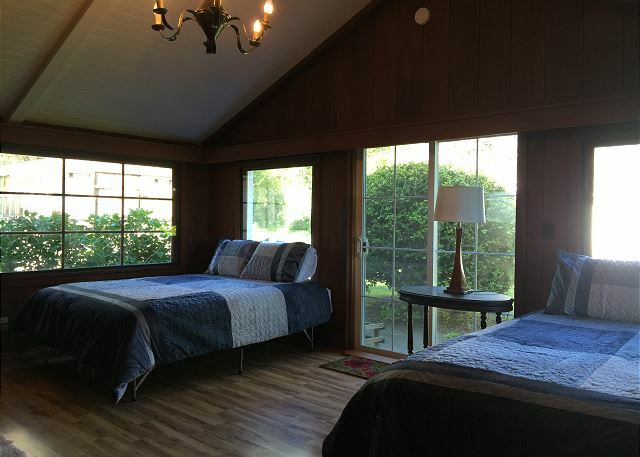 Thank you for choosing Redwood Coast Vacation Rentals for your getaway, and we hope we can accommodate you again. Lovely home on beautiful grounds. Incredible view! 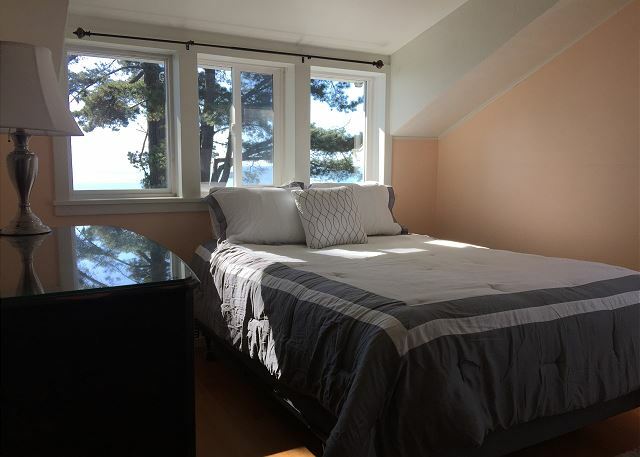 2 of the bedrooms have ocean views. 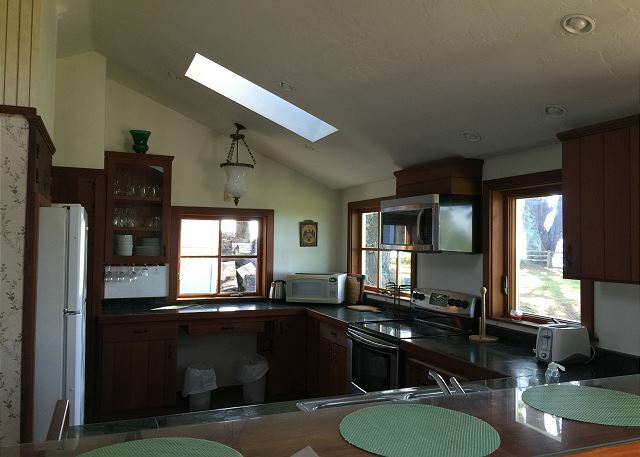 Kitchen and family room oriented towards view--lots of room for lounging and hanging out. Good size kitchen. Easy access to Trinidad and Redwood Parks. We had a small problem and property management quickly responded and resolved. Hope to come this way again. Thank you for choosing the Seaside Meadow. It was a pleasure meeting all of you and I am so glad we were able to resolve the issue at the house. We very much hope we will have the opportunity accommodate you all again. Thank you so much for booking with Redwood Coast Vacation Rentals. Had a great stay with my family! 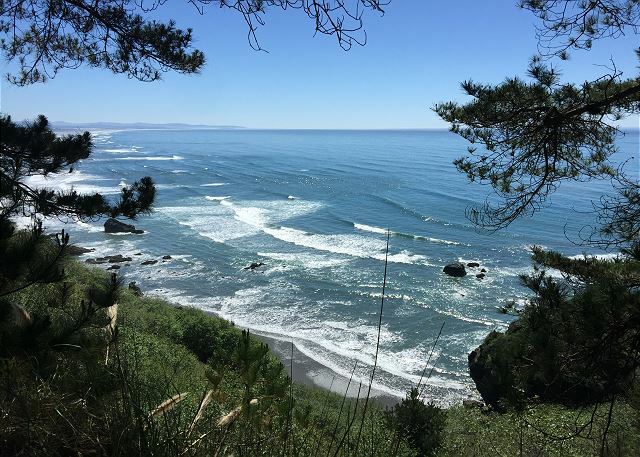 The Redwood Coast is amazing and so is the Redwood Coast Team! Thank you! Thank you for choosing the Seaside Meadow! We enjoyed having you stay with us. Please visit us again soon. Our family of 9 had a great time at this location. The house is super quaint and a great size for a big family. The view is amazing. So glad the Seaside Meadow worked out for you and your family. The view from the house is very special, and what a wonderful place to spend a family getaway. 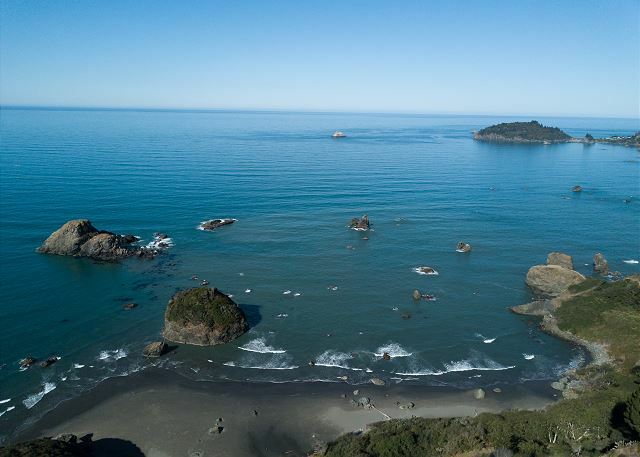 Thanks for booking with Redwood Coast Coast Vacation Rentals and we hope you will visit again. Great location, wonderful setting. Fireplace takes a bit of coaxing and doesn't draw well, but works. Very comfortable overall. Thank you for your recent booking at the Seaside Meadow Home. What a great location to stay in. Hope you will return to visit again. We wanted to spend our Anniversary in Trinidad, California on our way to Oregon. We were looking for a house rental with privacy and an ocean view. We were thrilled with everything about Seaside Meadow on the Bluff. 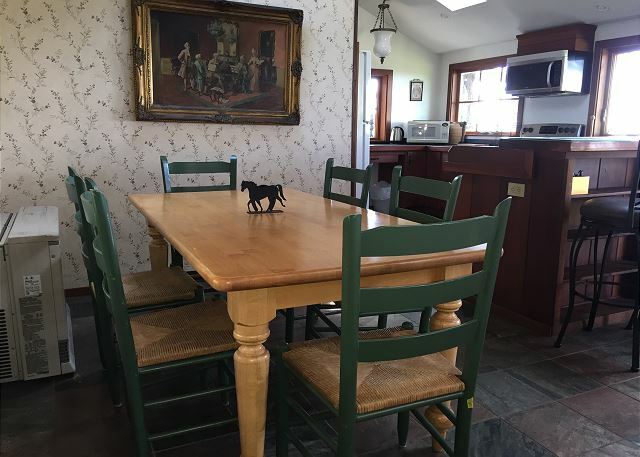 The house has an old country charm feel and was very comfortable. The ocean views were amazing from the bluff and the size of the property was an unbelievable amount of space just for us. My husband commented on what a good choice I made on this vacation rental and I certainly agreed. We would definitely come back again. Thanks for a wonderful and romantic Anniversary. What a lovely review! This house is quite a treat for those who appreciate it for what it is. This is a charming rustic country home, that was originially (going way back) a barn, that was converted to a house. The same family has owned it this whole time and have been quite a part of this Westhaven community. I am so pleased this home worked out well for your anniversary trip. I could sit in that backyard all day! What a wonderful, romantic place for your occasion. Thank you, and we hope you will return to visit again.